It’s possible that I’m suffering from early onset dementia but slightly more likely that I’m suffering from the effects of reviewing too many pubs but when I find myself in Soho I’m often inexplicably stumped for a decent place to head for a proper pint. These lapses in effective brain function are as annoying as they are embarrassing as Soho is teeming with bars and boasts some of our favourite establishments. The Dog and Duck ought to spring to mind whenever I’m at a loose end in this increasingly family friendly area as it’s almost certainly its best offering. It’s delicately tiled exterior sits on the corner or Frith Street and Bateman street and though I’m sure it’s always looked just as luscious this facade is all the more impressive when juxtaposed with its current neighbours – a Nandos and a Prêt a Manger. The Nicholson’s brewery has a good habit of maintaining its pubs in a style that respect their roots and this is no exception. Inside the walls are a continuation of the outside theme with hundreds of stunning enamel tiles surrounding mirrors adorned with adverts for products long since extinct; Hooper Struve and Co’s. First Class Mineral Waters anyone? 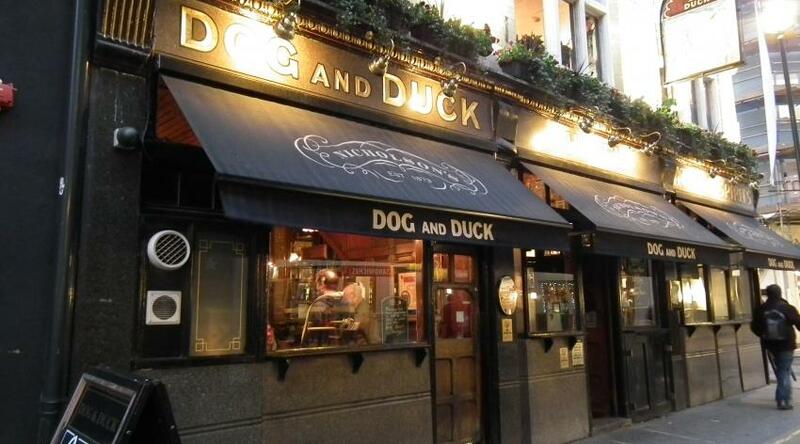 The only niggle I have with The Dog and Duck is that the bar serving area is unfeasibly small and for some reason is often haunted by a couple of those people who don’t seem to understand that upon acquiring a pint you ought to sod off elsewhere are get out of the way. This can’t be helped too much though and fortunately is well balanced out by it being well staffed by universally friendly people who move about in a mind bogglingly small space with incredible speed and almost no collisions. Parking your rump can be a bit tricky as it understandably gets a bit rammed as office workers head here after a hard day doing ‘things’ to drown their tie clipped misery in ale from an extensive selection. If you really want a seat then you can venture upstairs to the ‘George Orwell Room’ (he drank here a fair bit as did Constable…..Madonna has been too apparently though she isn’t going to get a room named after her as she tried to walk of with someone’s children). However I personally feel that this pub is best enjoyed when it’s bearably warm enough to head outside and sup your nectar on the pavement. oh fabulous! flashback memory, we stumbled across this place as tourists, and the staff are great. the barman recommended a fantastic restaurant for us to go to for dinner nearby. cheers!